In one of the best 4x800m Relays run in U.S. History Green Hope take down their 7:38.83 State Record as they clocked 7:32.06. The Falcons took 2nd in Northport (NY) after leading for 3150 meters of the 3200m Relay. Despite the narrow defeat, Green Hope's time is the 6th fastest 4x800m relay in US History. The team consisted of Matthew Kehn, Ares Epps, Sean Petersen and Ian Delgado. Kehn started them off and with a fight for position, he was able to squeeze his way to the front on the first leg. He handed off to Epps in 1:53.24 with a one second lead over the field. Epps was out front and though he had a challenge early from St. Benedicts Prep (NJ) he was able to regain the lead Kehn established and add on a little bit more over the field splitting 1:52.25, the second fastest split over the second leg. Petersen got the baton up front, but the field was in chase with Northport (NY), St. Benedicts Prep (NJ) and East Greenwich (RI) all in striking distance. Petersen was able to pull ahead of second place, but Northport came from 4 seconds back and handed off pretty much even with Green Hope. Petersen's split was 1:55.21. Delgado was able to get out of the exchange zone just ahead of Northport. They had a star anchor of their own in Isaiah Claiborne, who was happy to sit on Delgado and bide his time. Delgado held onto the lead up front through the first 400m. It was certainly down to a battle between Green Hope and Northport. As they approached 100m to go Claiborne swung wide of Delagdo and with 50 meters to go he pulled slightly ahead of Delado and was able to hold on through the line in US#5 All-Time fashion clocking 7:31.62. Delgado closed in 1:51.37 on the anchor leg. Green Hope was not far back running 7:32.06. 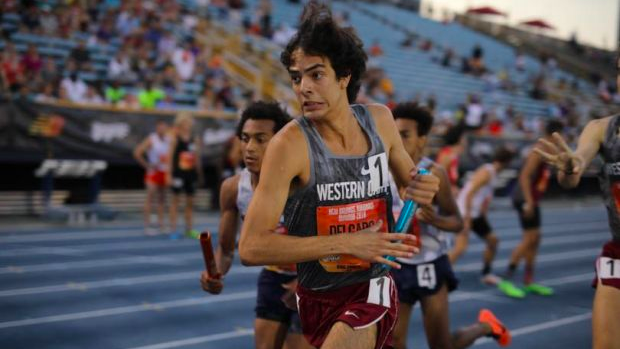 It's the second best 4x800m race ever assembled in United States history behind NBON in 2011 where Long Beach Poly (CA) and Charlotte (FL) went US#1 and US#2 All-Time. Weddington boys took 7th overall out of section 1 where they ran 7:42.23 with splits of 1:56.78 from Will Mazur, 1:58.61 from Jake Toomey, 1:55.54 from Jackson O'Hara and 1:51.32 from Kyle Durham. The mark will be NC#3 All-Time behind 2018 and 2016 Green Hope squads. They're the second fastest school in state history and return their entire squad.